Yes, I succumbed. Every single person on my Facebook feed has been raving about this stupid thing and posting about how it is on super sale right now. "Who knows?" I thought. "Maybe this is the thing that will rekindle my love of cooking. I'll buy it!" Would you believe I haven't cooked since last Thursday morning, by the way? Anyway, I'm out all day tomorrow; but the next day...well, the next day I'm bound and determined to learn how to use a pressure cooker and make a delicious meal in minutes. 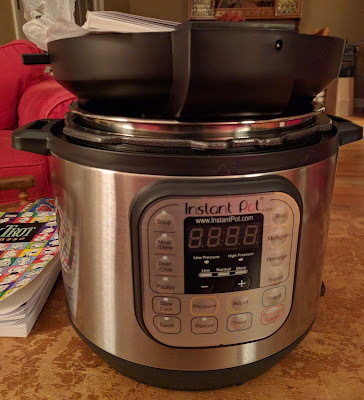 Although, from what I can tell, this darn thing doesn't do the grocery shopping for me, and really, the hardest part of cooking a meal is making sure you have the right ingredients in the house at the right time. 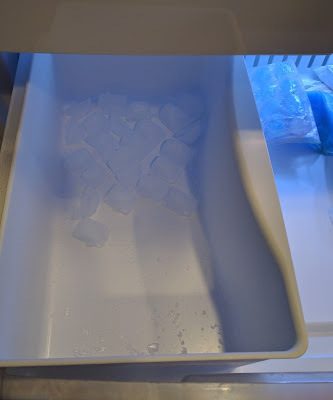 Today the plumber arrived to hook up our ice machine. I sure hope my children regard machine-made ice as the perfect Christmas present, because that plumber visit cost me $210. That's pretty fancy frozen water, if you ask me. In other news, um, well, nothing. I drove around all day today, ferrying children hither and yon. Did the NYTimes crossword puzzle. Went to a birthday dinner for a friend. Wasted time on Twitter. I'm thinking I really need a regular job. 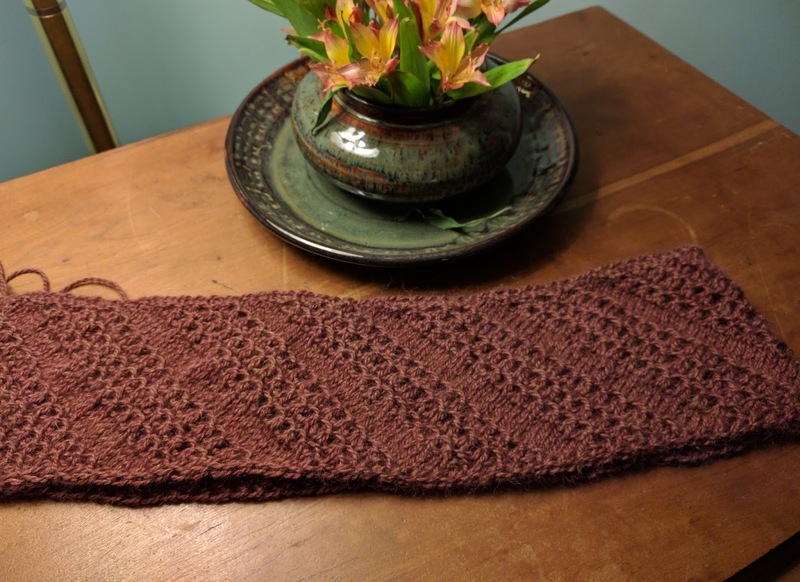 I mean, once I finish the Christmas knitting. That comes first. As you might recall, our new refrigerator (which I adore) periodically made a VERY LOUD buzzing sound. As this is not behavior that one expects from a brand-spankin'-new household appliance, I called Home Depot and asked for a different one. I was very proud of myself for speaking calmly and assertively and getting positive results. I'm a grown-up! SO, on Friday, as if I had not already moved food around enough on Thanksgiving, I had to empty the fridge of ALL the leftovers and ALL the condiments and everything else, so that the delivery guys could take it away and give me my new one. This was not fun. Still, I didn't like the loud buzzing sound, so I persevered. 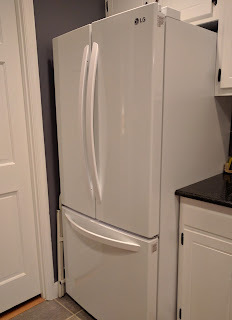 The guys arrived and hauled out my almost-new fridge and brought in the even newer one. "Just leave me the hose for the ice machine," I told the one in charge. "I still need to have the plumber come by and do something under the sink so we can hook it up." "Oh, okay," he said. Then he pulled open the freezer and, reaching in toward the back, said, "Let me just make sure this button is turned off." He pulled his head back out of the freezer to find me staring at him. "Did you just do something?" I asked, comprehension dawning. "Yes," he said. "The button for the ice machine is back there. If it isn't hooked up, you have to turn it off." "So, uh, the first delivery guys didn't do that?" he asked, comprehension dawning on him also. "No," I said. "No, they didn't." He looked at me and then shrugged. "Well, I'm not bringing that other one back in here. Let's just pretend we didn't figure that out." So, yeah, no loud buzzing sound this time. None whatsoever. My only hope is that someone benefits from all this by picking up an almost-new fridge real cheap. 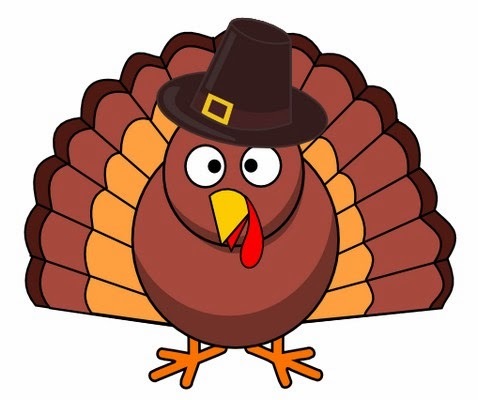 Silly me - just because I made the stuffing, cranberry bread, and cranberry sauce ahead of time, plus bought the pies, plus cleaned up the house (somewhat), I naively thought that today wouldn't be too difficult. But no, I got up at 8 this morning and didn't stop moving for, oh, 5 hours. The whole time I kept saying to Brian, "I don't care WHEN you are working next year, we are NEVER scheduling dinner for 1:30 AGAIN." I just couldn't adjust to having the holiday meal that early. What made it worse was that it was a beautiful day out - who the heck wants to be inside eating dinner when the sun is high and the temps are almost pleasant? I kept thinking I would get a chance to go on a walk while the turkey was cooking, but there WAS NO TIME. Mashing potatoes, more cleaning up, finding 14 decent cloth napkins from our raggedy table linen collection - it took forever. And then afterwards, of course, there was clean up. The quote of the day came from Rachel, who -when we told her to wipe down the kitchen table and sweep - said, "I ALREADY emptied the dishwasher!" in her most irate tone of voice. She apparently hadn't noticed Larry and I working our butts off all day. So, yeah, I'm pretty much done with this whole Thanksgiving thing. I still have to wait up until Brian finishes his shift, though. 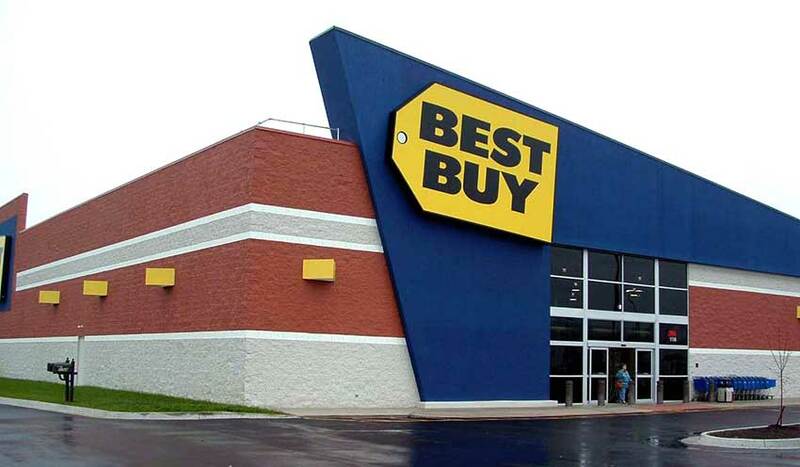 Larry dropped him off at Best Buy at 4:30, and there was already a line of people going around the building. What is up with these stores opening for Black Friday on a Thursday? Are days of the week not sacred anymore? I say, keep Friday for Fridays. It's my new slogan. It's almost midnight, so I could just go to bed, but that would be too sensible. Naturally, with guests coming over tomorrow, and a big dinner to make (plus 2 dental appointments today), I decided to throw a flu shot in there for the fun of it. Here's hoping I don't feel under the weather tomorrow, because I don't even get to sleep in. You see, we had to schedule our dinner at the unaccustomed (for us) early hour of 1:30, because Brian is scheduled to work at 4:30 on Thanksgiving Day (THANKS A LOT, BLACK FRIDAY SHOPPERS). Open on Thanksgiving Day? Seriously? But the tables are extended, (most of) the food made/bought, guests invited. 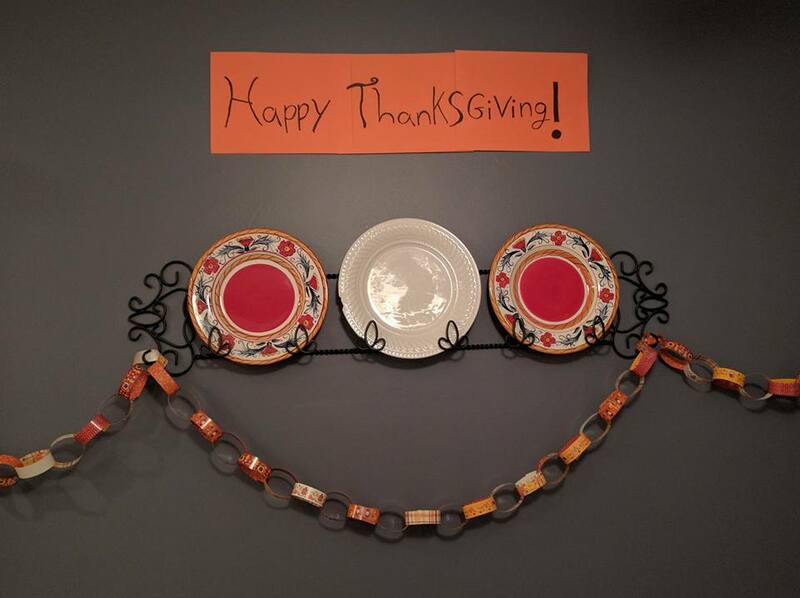 Our event has turned into a BYOPlate deal, since I couldn't find cute Thanksgiving paper plates at a reasonable deal, and we only own 11 dinner plates (half of them chipped because we like to break things, apparently). I think there are enough forks, though, so there's that. I've fallen in love with this goofy turkey. You know, Larry and I have been married for more than a quarter of a century. 25 YEARS. So I have no idea why we don't have enough dishes, etc., for a normal Thanksgiving dinner (with the 3 oldest kids absent, to boot). NO IDEA. What I do know is that, when the last guest has gone and the last dish been washed, I am going to sit down and start a 3-day knitting marathon. 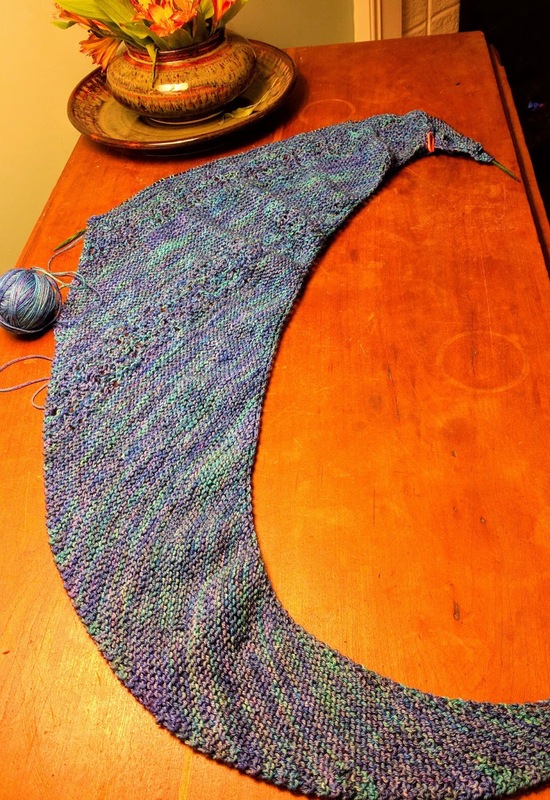 No cleaning, no cooking, just me and my yarn and my needles, clicking away. Christmas is coming, and THERE WILL BE GIFTS, and they shall be made of natural fibers. So sayeth the prophets, and so it shall be. Oh, dear - outrage levels are running high. Look at the comment I received today on this very old post, from someone who apparently doesn't recognize pretty heavy-handed sarcasm. One would think we have enough to be outraged about RIGHT NOW not to have to go looking back at something I wrote in 2010. Or maybe we are all just permanently outraged about everything by this time. I blame the Internet. 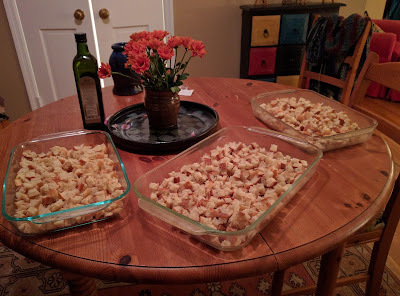 I spent my evening cutting large baguettes into tiny cubes. That's what we do around here on Thanksgiving Eve Eve Eve. Or, hey, Thanksgiving Eve Cubed! Get it? Cubed! Oh, my gosh, I slay me. Anyway, that particular task has to be done by Monday so the bread cubes have time to dry out enough to soak up all the other stuffing ingredients without getting soggy. 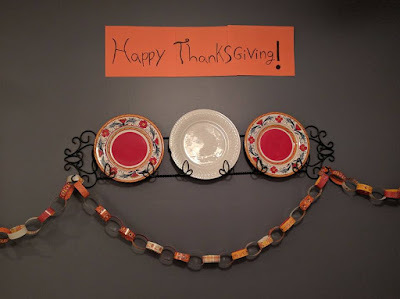 So now they'll sit around in pans on my dining room table for 2 days, annoying the heck out of me. Thanksgiving prep is fun. At least I don't have to make the pies - I can buy those from Harris Teeter. For that, I am thankful. My toilet woke me up 4 times last night by half-flushing itself LOUDLY. We would call a plumber, but we don't want to spend money on a toilet that we are replacing in January when the entire bathroom gets remodeled. This is such a stupid problem, but it is driving me crazy. If I turn the toilet valve off at night, will that keep it from flushing? Anyone? Today was noteworthy in that I finally managed to find winter coats for Susie and Brian. I still need one for Rachel, if I can ever find time to take her to the store. If everyone could just stop growing for a bit, my wallet would surely appreciate it. And if someone could make a coat that fits a round-ish middle-aged woman without making her look EVEN ROUNDER, I would be forever grateful. I swear, I try on all these coats and they all make me feel like a chubby 4-year-old stuffed into a snowsuit. Yeah, I have issues - what of it? Oh, uh, hi! Anyone still here? Oh, who cares - I talk to myself all the time anyway. Remember this? The French door refrigerator with the pull-out bottom freezer that stole my heart almost 8 years ago? Well, I've been watching the prices ever since but not buying, since spending $1500 or more on an appliance sort of horrifies me. But the other night, on my toilet-seat buying errand at Home Depot, I noticed my inamorata, sitting there in the main aisle, with a big SALE sign on it. It had dropped to under $1000, and I knew - I KNEW - it was time. I mean, hadn't I been pining to consummate our love for almost a decade? Didn't I own an 11-year-old fridge with cracked vegetable drawers that was threatening to quit at any minute? Yes, it was time to take the plunge. So really, my $5 toilet seat ended up costing me way more than that. I went home, ordered the fridge online, set up the delivery date, all without even asking Larry. 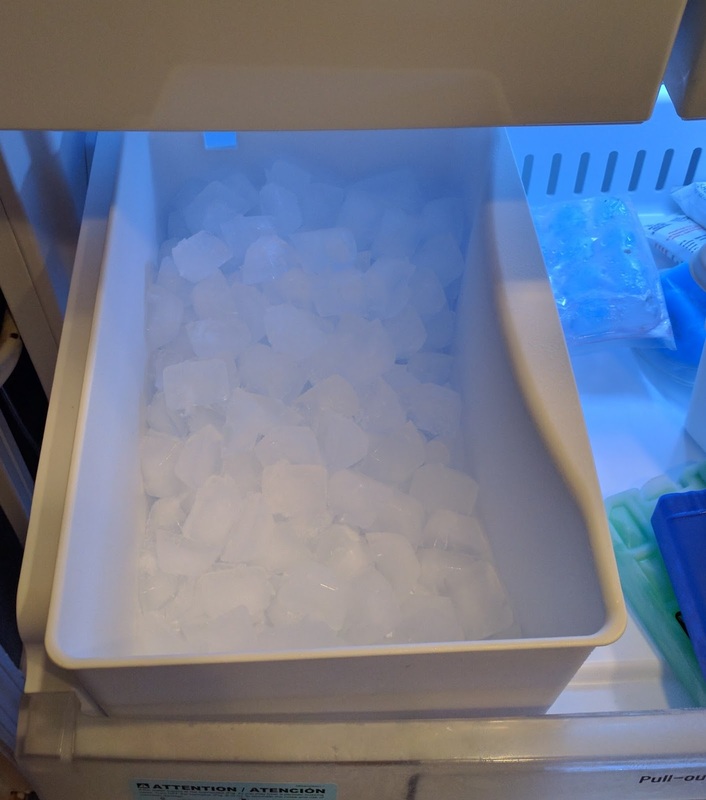 Feeling magnanimous, I promised the children that they would no longer have to make artisan ice cubes - I would pay the money to have the ice machine hooked up. Oh, there was great rejoicing! The fridge was delivered last week, and it has been all I have ever hoped or dreamed. 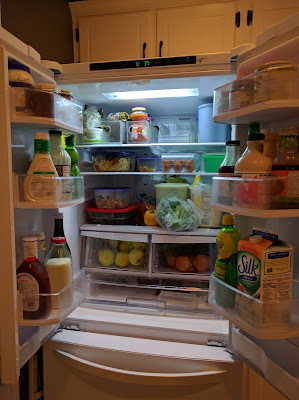 The shining glass shelves, mostly at eye level; the myriad door compartments for all my condiments; the extra drawer at the bottom that I designated "Dairy Only" to keep my oldest safe when he visits - it is all like a dream come true. We filled it up right quick. Only...not. Turns out our new acquisition has a penchant for periodically making a REALLY LOUD buzzing sound that should most definitely not be emanating from a brand-new appliance. So I called Home Depot and demanded a new one and it's arriving on the 25th. And until then? My children are stuck making ice cubes the 20th-century way, because I'm not paying the plumber twice to hook up the ice machine. A really quick note to say THANK YOU to those of you who chipped in for our handyman's medical expenses. 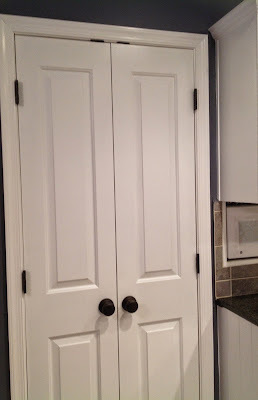 It was nice to know you appreciated reading the blog enough (or at least were concerned enough about Larry's next home improvement project) to help out a person you've never even met. And now he is probably sitting at home wondering who all those people are whose names are showing up on his GoFundMe page. Also, Auntie Kate arrived and we've already been to 2 yarn stores and managed to inundate the living room with fiber and needles and all. Plus, she went canvassing with me for GOTV. So, yeah, busy. 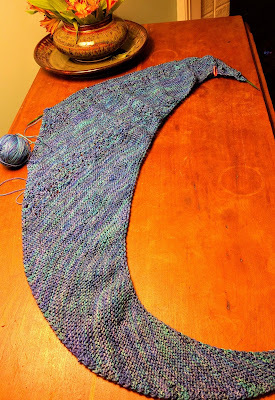 Despite that, I was all set tonight to begin work on the Nurmilintu shawl I promised someone for Christmas. You see, the hold-up for the past 2 months was that I didn't have the right size needles. 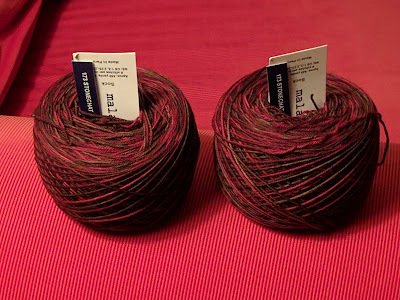 I remedied that problem today, by buying them at the same time as that lovely yarn pictured above. Finally! I thought. I am all set. Only, the yarn gods have seen fit to laugh at my ambitions. I have spent all evening trying to find the skein of Painted Desert that was slated for this particular project. It's been kicking around for the last 2 months, in project bags and baskets and - at one point - on my nightstand; and every time I saw it, I thought, I have to get those needles. So now? Now that I am "all set"? It has completely disappeared. Nice one, yarn gods. NICE. This is an AFTER picture. I KNOW. I almost posted last night, but I'm glad I didn't, because in retrospect I was borderline insane. Auntie Kate (she of crafting fame) is arriving Saturday, which means we had to excavate our guest room in the basement (where Anna had been staying all summer and where she left ALL HER STUFF because she is studying abroad this semester and could take only two suitcases with her). But first I had to GET TO the guest room, which meant Larry had to clear the hallway down there of all the stuff he pulled from the laundry room during the Great Foundation Leak of 2016. That's right, he put it back into the now extremely disorganized laundry room (remember? the one I paid our handyman good money to organize for us?) so that I could deal with the rest of the basement. Look, I never claimed that we were normal. It's okay, right? Tell me it's okay. Anyway, by yesterday evening, I was practically weeping. 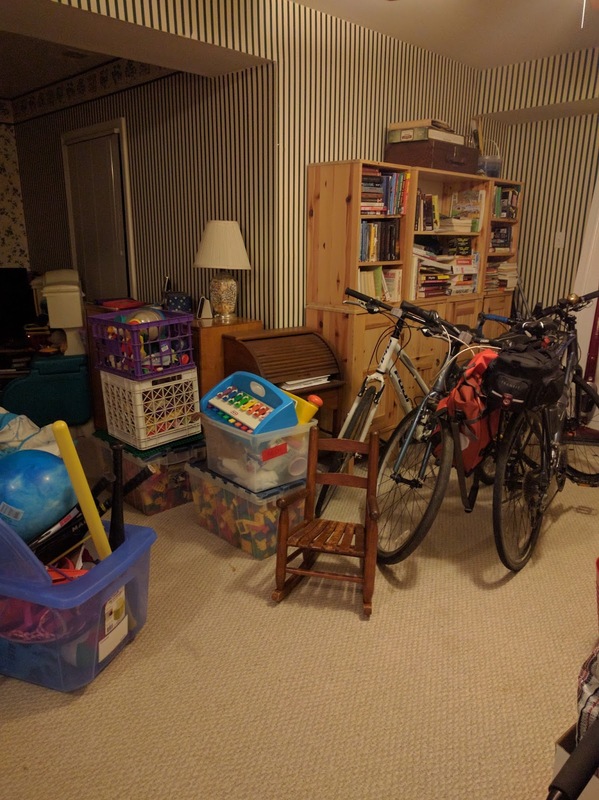 There was SO MUCH STUFF, plus Larry had never put the camping gear away in the guest room closet, back in August, so we had that to deal with also. Then there were the canoe paddles in the basement family room, along with 3 ironing boards, 2 older vacuums, a toy kitchen (our youngest is 11, for heaven's sake), and assorted flotsam and jetsam to deal with. You know, it's enough to make a gal pine for a 1-bedroom condo (with den - all that yarn has to go somewhere) to live in, all by herself. But against all odds, we're ready for the visit now. I do seem to have developed a slight tic where I walk around muttering, "Too much crap, too much crap" over and over; but otherwise things are fine. FINE. The basement looks livable (well, what we call livable, anyway), we replaced the moldy toilet seat on our 45-year-old basement toilet (only $5! 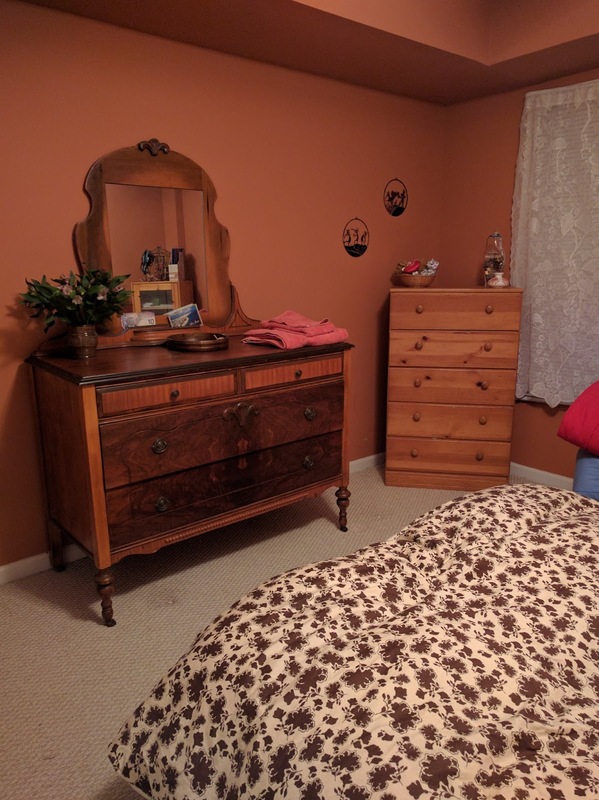 I should have done this years ago), and I even remembered to buy flowers for the guest room. But hey, back there, where I mentioned our handyman? Remember, he's the one who has been with Larry from the very beginning, framing and drywalling and installing baseboards and helping us choose paint colors and decide on kitchen cabinet hardware. I honestly believe this man, with his preternatural ability to moderate heated discussions about home decorating decisions, has saved my marriage. Not once, but several times. Not only that, but he has given my kids a thorough grounding in the music from the 70's and 80's. Every morning he'd arrive at 8 AM and (first thing) plug in his heavy-duty contractor's radio and let those tunes blare. I have an 11-year-old who can walk into a store and immediately identify the Credence Clearwater Revival song that is playing on the Muzak. All thanks to him. Granted, she was singing the lyrics to "Jack and Diane" at the rather tender age of 8; but I convinced myself she didn't really know what she was saying. 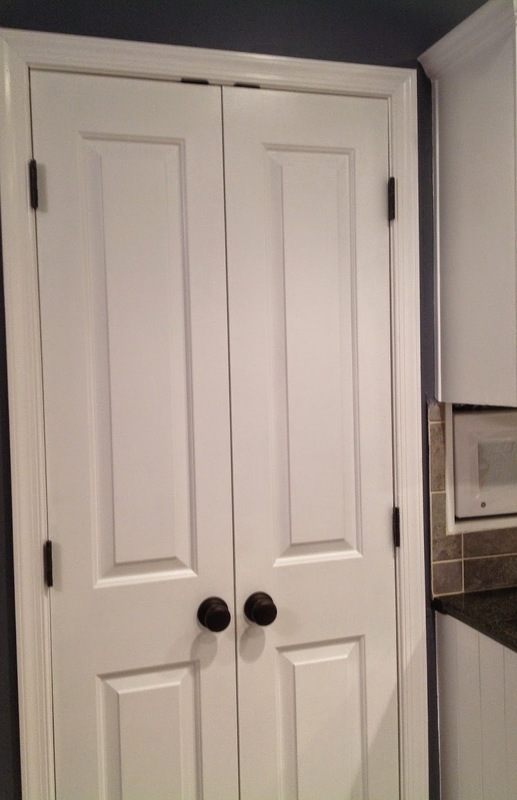 He built this pantry for me. So, for the first time in 9 years, I'm asking you to think about contributing a little money. Not to me, of course - but if I have ever made you laugh or if you look forward to reading this drivel of mine on a somewhat regular basis, please consider making a donation (however small - I think just the feeling of people rooting for him would be helpful) to his GoFundMe page. What's it worth to you, knowing that my life is way more chaotic than yours? 5 bucks? 10, maybe? Whatever it is, send it his way, so that hopefully his convalescence can be a little less stressful. Let's face it - we need him in good shape for what Larry has planned for next year.